You enter the red and white striped tent with such excitement and anticipation. Crossing through the opening flaps, you are automatically transported back in time. Back to the early 1900’s when Circuses were at their prime. You forget about all your troubles and are in awe; mouth agape, of all that is around you. Hundreds of people sitting neatly and looking intently onto the three ring circus performance in the middle of the stage. They, and you, have all paid good money to enjoy yourselves and get lost amidst the marvels that the circus holds. Elephants, lions, tigers, giraffes, tightrope walkers, fire breathers, jugglers, and unicyclists all perform such precise movements that work so perfectly together. Intertwined into somewhat of a dance, you start to believe that anything is possible. A woman, elaborately dressed is perched on top of a grand elephant and you’re automatically impressed, as how they’ve managed to train such an enormous wild animal, is beyond you. Applause raptures the entire tent, people begin to stand, few are crying, some are laughing, but everyone is having a great time. You exit the main tent, and as you walk around the circus, enjoying the music, the sideshows and admiring the other guests, you suddenly stop in your tracks. Something has caught your attention. It isn’t a bearded lady, that has captivated you. Nor a tattooed man, or even a contortionist. No, this is something much more mesmerizing than a circus performer. This is something that even you can’t resist, and are willing to pay an arm and a leg for. 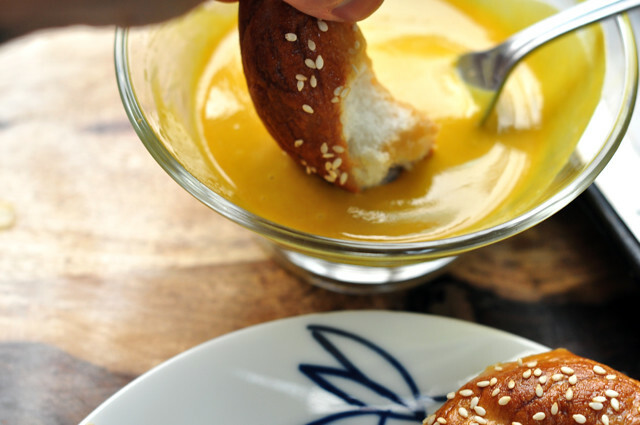 The smell of warm pretzels fills your nose and instantly makes your stomach growl. It wouldn’t be a trip to the circus without a “carnival” snack. You make your way through the crowd, searching for the vendor with the treasure you seek. By now nighttime has fallen, the circus’ music is playing all around you, and the white light bulbs hanging on strings up above are the only form of illumination. The crowd is thick and tricky to maneuver through, you feel like you can’t breathe as smoke fills and burns your lungs. All you want is a warm pretzel and somehow you can’t seem to find it. You continue to make your way through the crowd, more determined than ever. 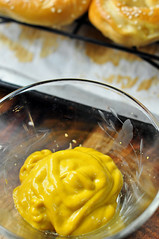 You search and search and see people dipping pretzels into mustard. Finally, some progress. You resist the urge to bite people’s pretzels. You look up, and there in the distance you see a beacon of light. 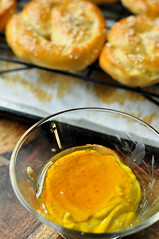 A tiny cart illuminated with heat lamps, emitting the most powerful and enticing smell of all; warm soft baked pretzels. A man in a striped shirt, a vest and a bow tie is standing behind it, inviting guests to buy. With the horrible thought of pretzels running out, you pick up your pace, dash for the cart, pushing and shoving people out of the way. Now is not the time for formalities, pretzels are on the line. When you finally get to the cart you ask for three pretzels. A stern look. “Oh my children are waiting for me somewhere.” A lie. You haven’t any children. No, the three pretzels are for you. You scarf down the first one in pure delight. 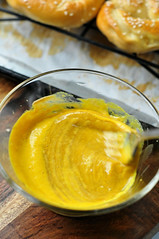 The second one you take your time and even make an effort to dip each piece into a bit of mustard. You’re relaxed now. Slowly walking through the circus, enjoying the crisp cold air, the music, the lights, you slowly and meticulously eat your last pretzel. You’re not sure if you’ll ever come back. If you will once again have the pleasure to encounter such an enjoyable atmosphere. If the time came, you’re positive that you could live without the circus, if need be. But one thing is for sure. 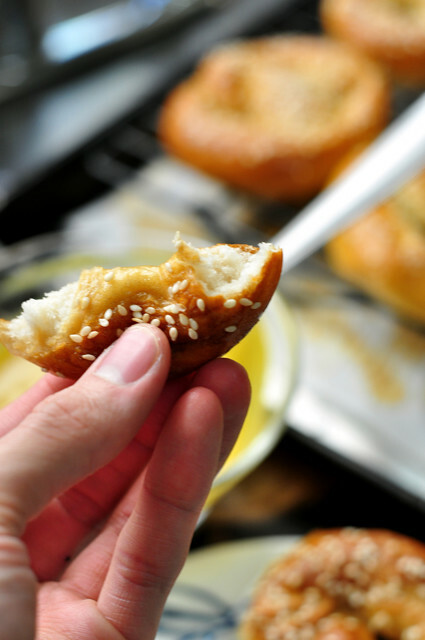 Never in a million years could you live without warm soft pretzels. With a smile on your face, a warmth in your heart, and a happy stomach you make your way home with nothing but pretzels on your mind. Well, its rather simple really. 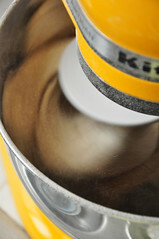 You start with a mixer fitted with a dough hook, and a clean bowl. 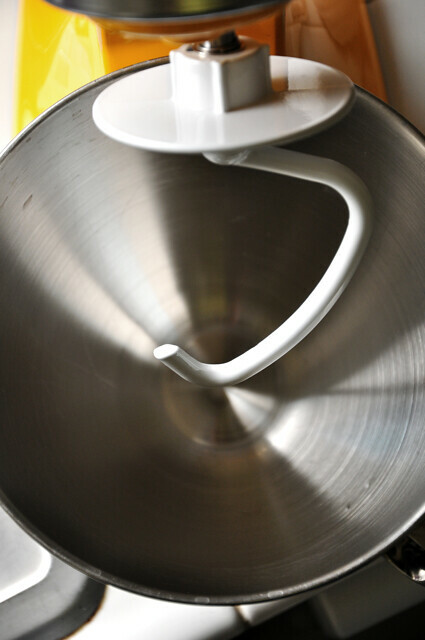 If you lack one of these, above, you can also just grab an empty bowl and a wooden spoon……Good Luck. No, it’s really simple that way as well. A good workout. 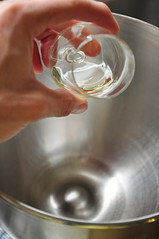 But anyhow, I digress, pour the warm water into the bowl. 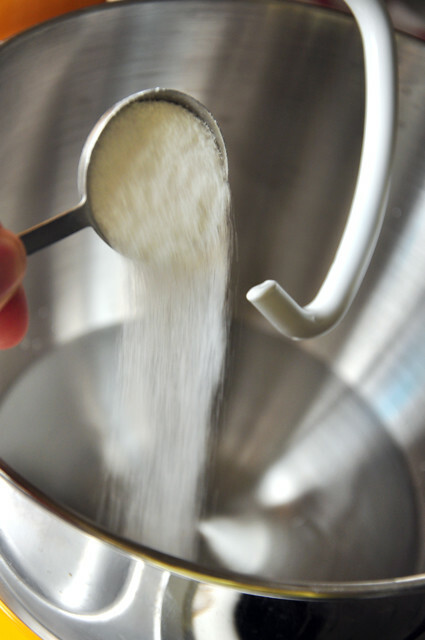 To the water, let’s add some sugar. A tad of granulated sugar. 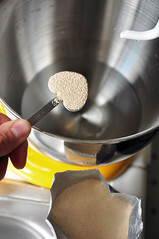 But this little bit of sugar, doesn’t make the dough sweet at all. Its food for the yeast, to eat and grow. You won’t taste it. Trust me, throw it in. 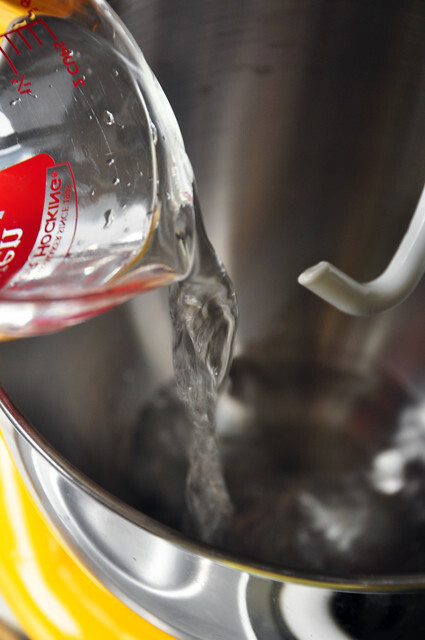 Okay, so now mix the water to dissolve the sugar. 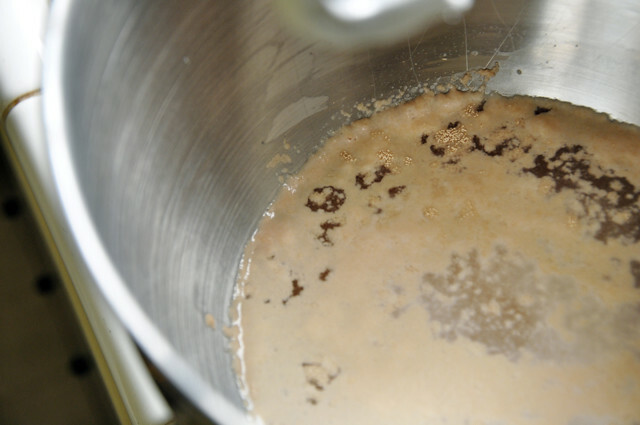 It’s now time for the yeast. 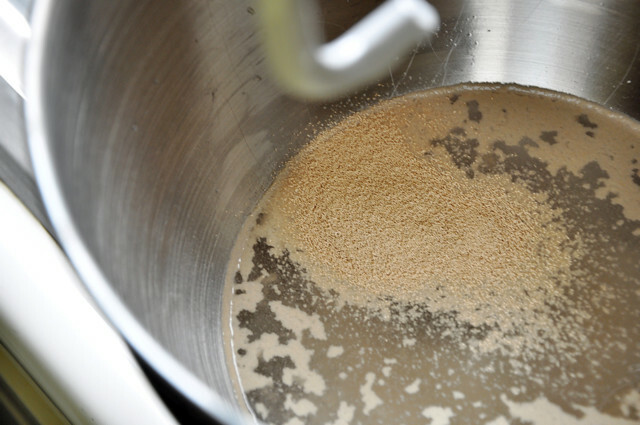 You’ll need to toss in 1 package of active dry yeast. 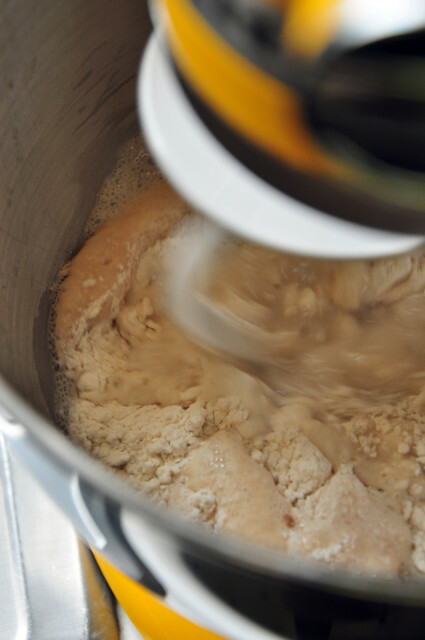 But if you’re anything like me and you buy yeast in bulk, and keep it in the fridge; you’ll have no idea how much is in a package of yeast. 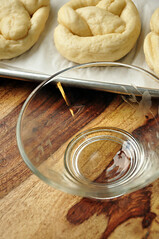 Don’t worry, 2 and 1/4 teaspoons yeast roughly equals a package. 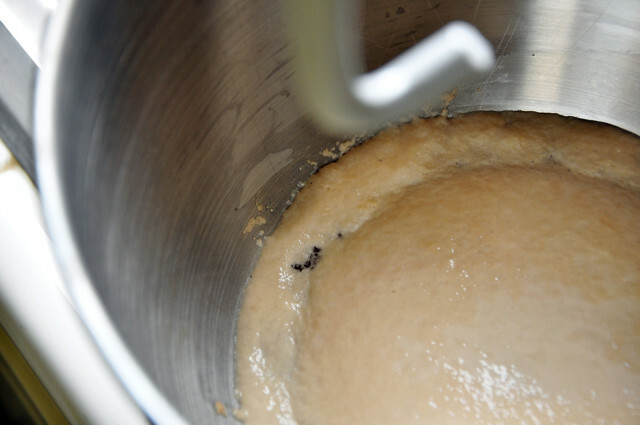 Allow the yeast to sit, untouched, for about 10 minutes or until foamy and frothy. 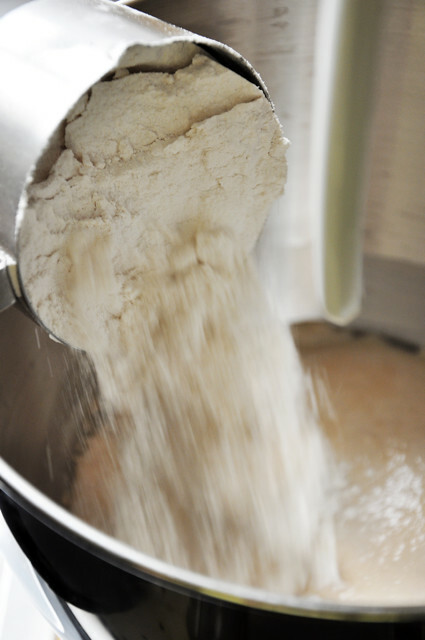 Once the yeast is ready, its time to add some flour. 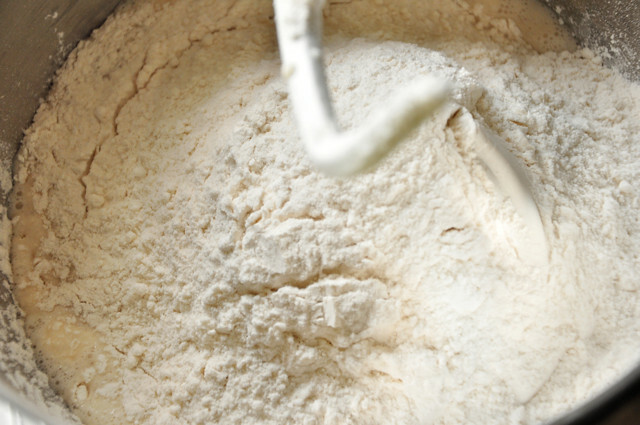 Add one cup of the flour. Mix it on low, until combined. Mix again. Start on low, and gradually raise the speed to medium-high. 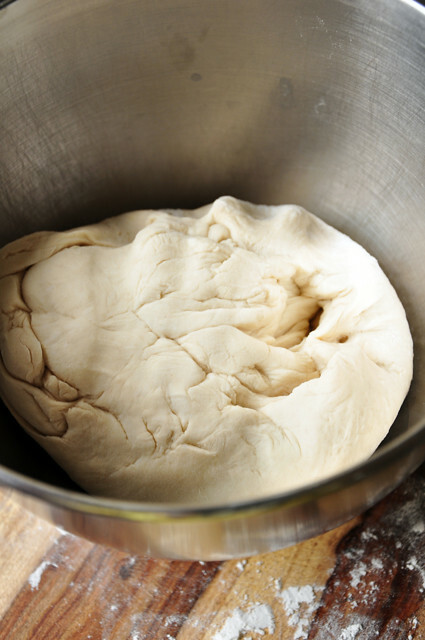 Continue to mix the dough until it forms a ball and comes away from the sides of the bowl. 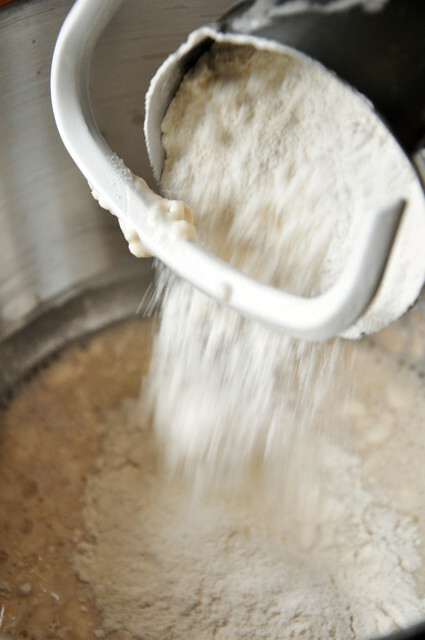 At this point, if the dough is too wet, add a 1/2 cup more of flour, a little at a time until it forms a semi-sticky dough. 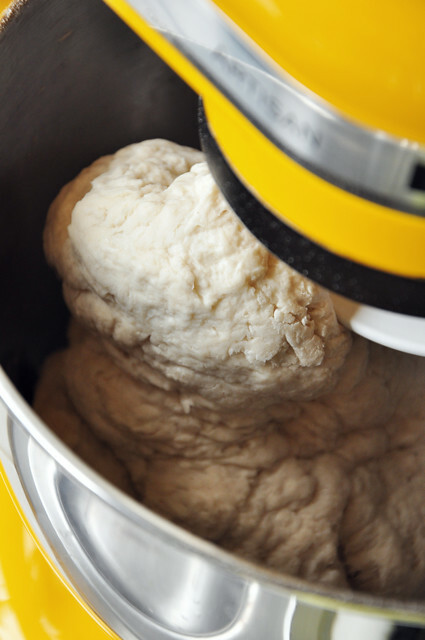 Knead the dough on high for about 5 minutes. 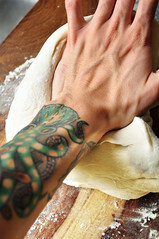 The dough will be soft and slightly-sticky to the touch. 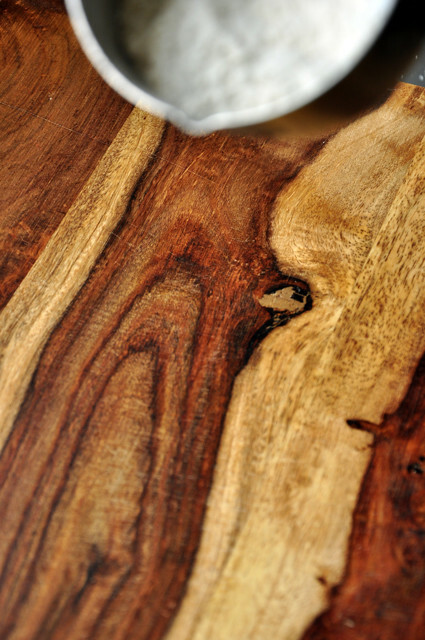 Once ready, you’ll need a wooden cutting board, or any other kneading surface. 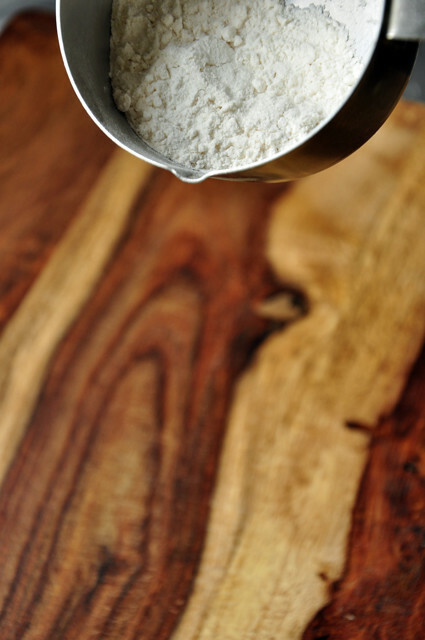 You’ll also need some flour. 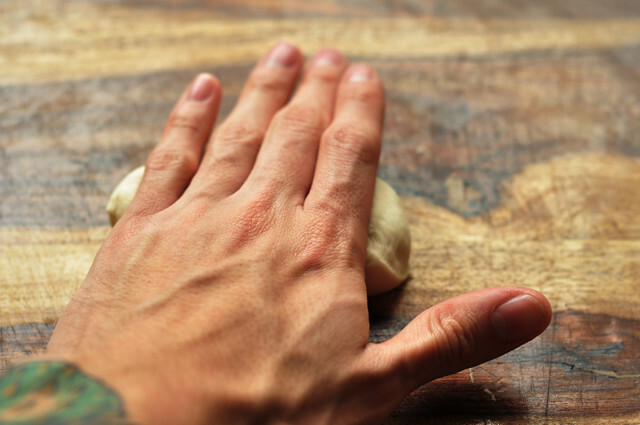 You wouldn’t want the dough to stick to the surface, would you? 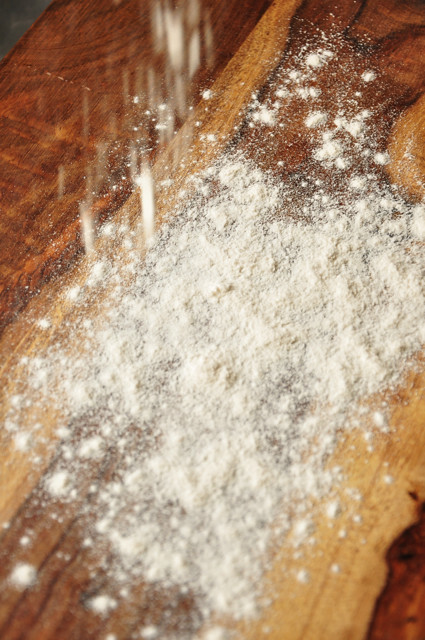 Sprinkle the surface, lightly, with flour. 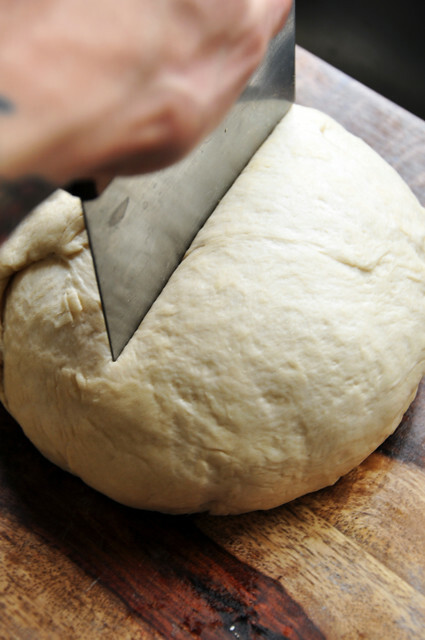 This will prevent the dough from sticking. 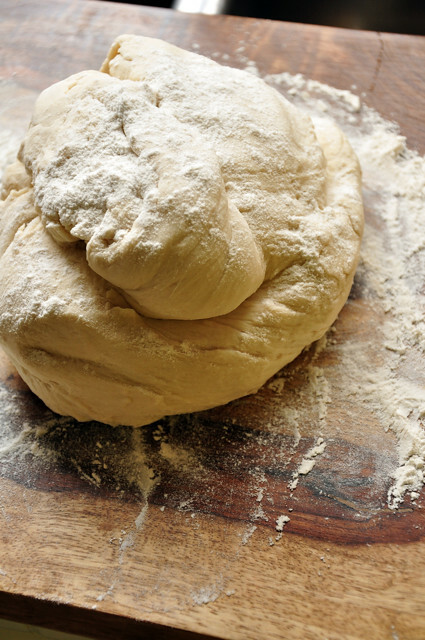 Let’s get back to the finished dough. 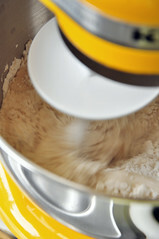 And sprinkle a bit of flour on top of it as well. More kneading?!?! Yes, more kneading. 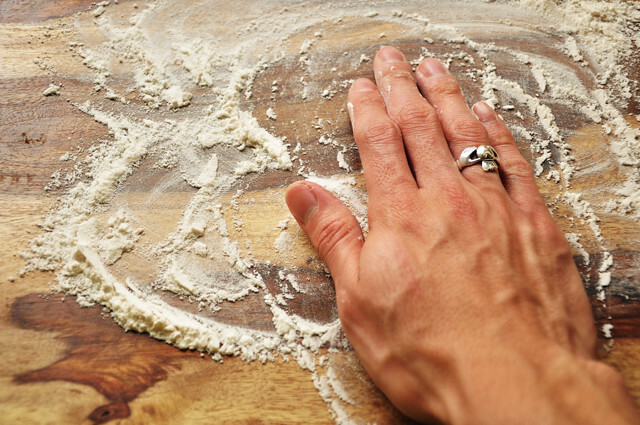 Just knead by hand, five-to-six times until the dough comes together and becomes smooth and elastic. 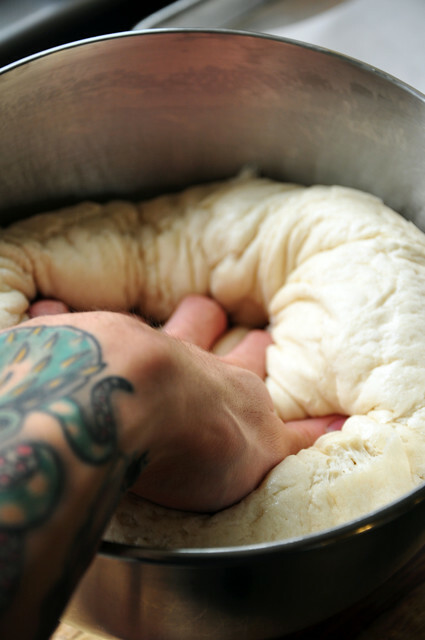 Form the dough into a tight, smooth ball. Grab a bowl. 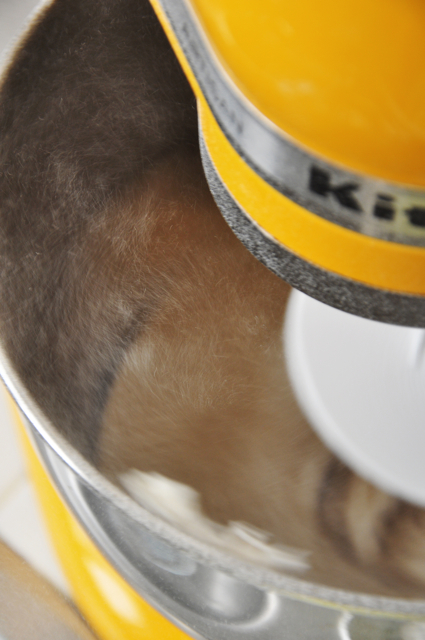 I have an extra mixing bowl now, so that’s what I’m using. Any large, preferably metal, bowl will do. 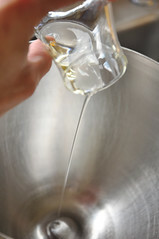 Drizzle the bowl with the oil. Feel free to use a vegetable or canola oil. 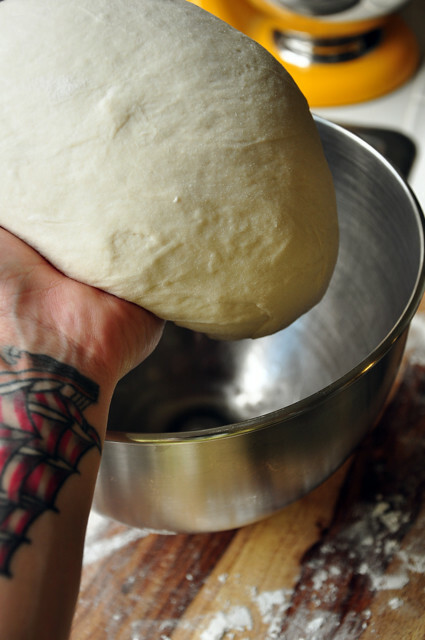 Don’t use olive oil, as it will flavor your dough. You can also just use cooking spray, if you’d like. 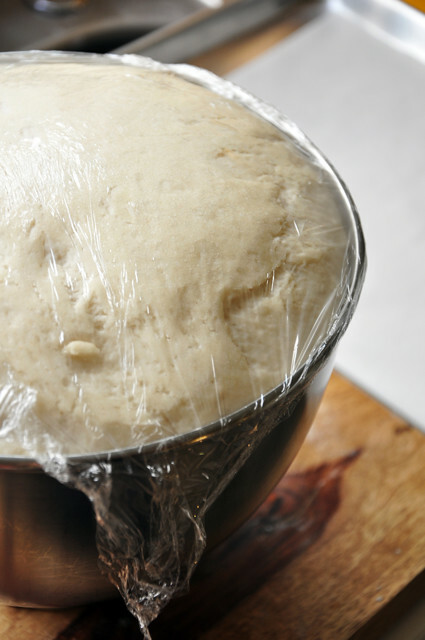 This is just to prevent the dough from sticking as it rises. 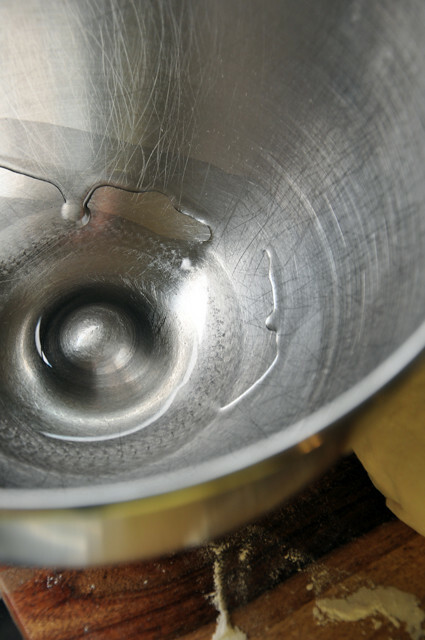 Make sure to evenly coat the bowl with the oil. We mustn’t forget about the sides. 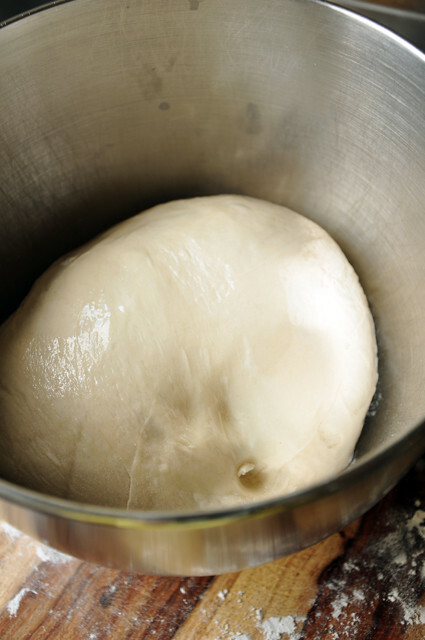 Drop the dough ball into the oiled bowl. 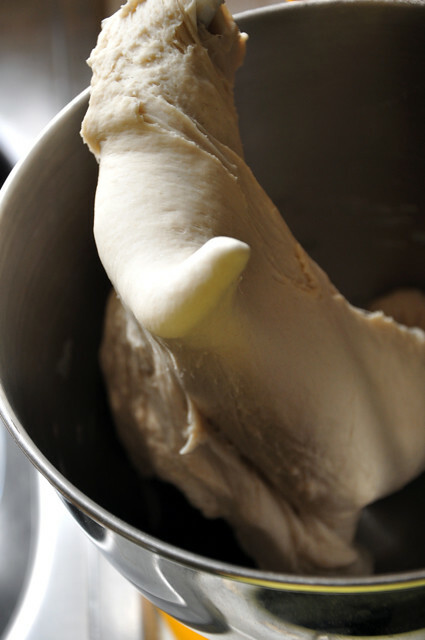 Turn the dough over. 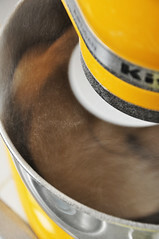 This will allow both sides of the ball to get coated with the oil. 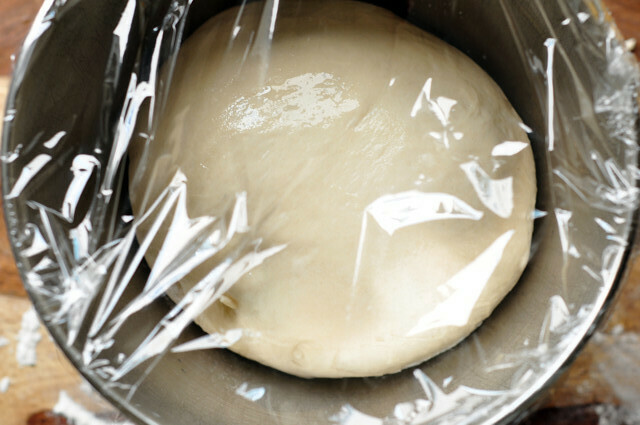 Cover the dough, loosely with plastic wrap. 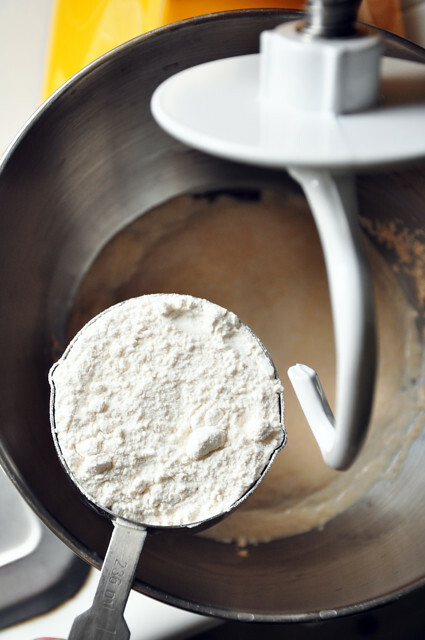 Don’t tightly cover it, and smother the dough to death. 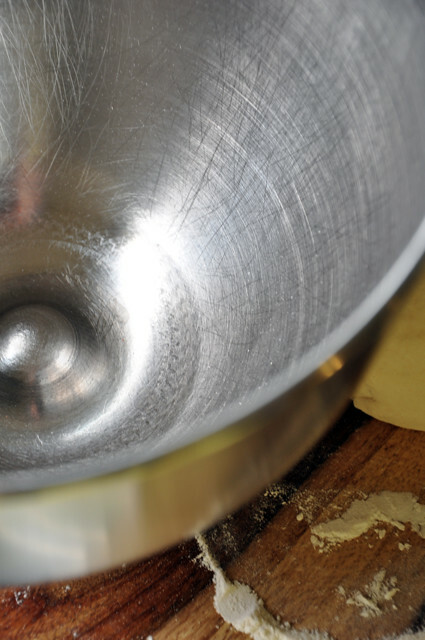 Cover the bowl with a damp cloth. Place the bowl in a warm place. I generally like to place it in the oven, turned off of course. 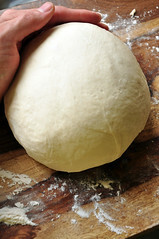 Allow to rest for about an hour, until it has doubled in size. Lucky for us, we don’t have to wait a whole hour. With the magic of technology……. 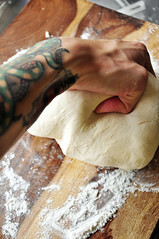 Punch the dough down to allow the air to escape. 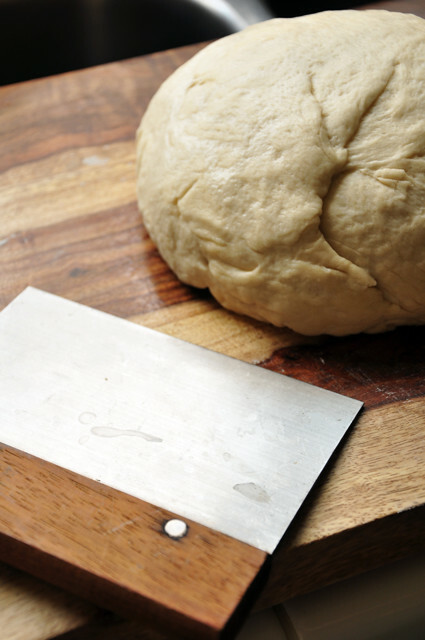 Turn out the dough onto a cutting surface. 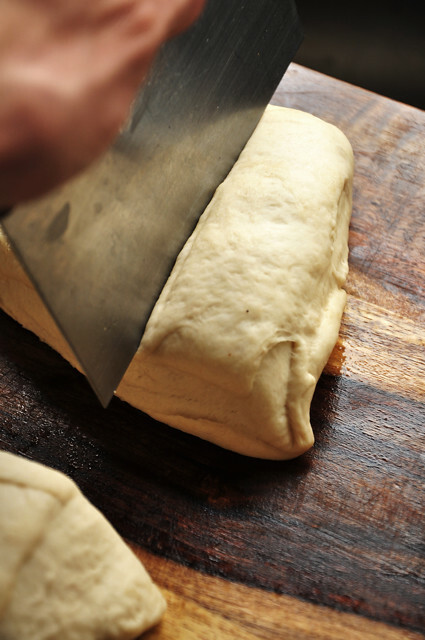 It’s time to portion out the dough. 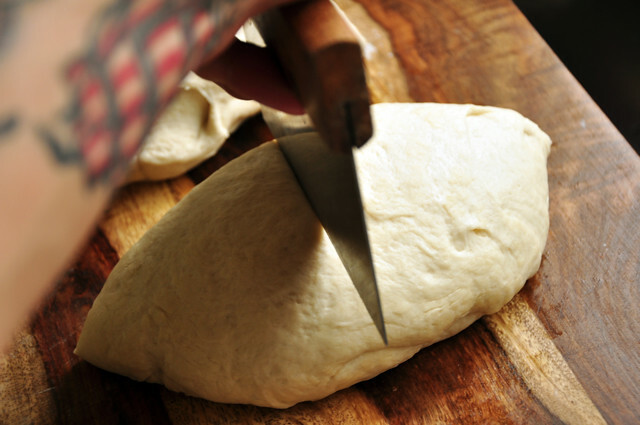 Using a dough cutter, or a knife, cut the dough in half. And then cut each half in half, so you end up with four pieces. 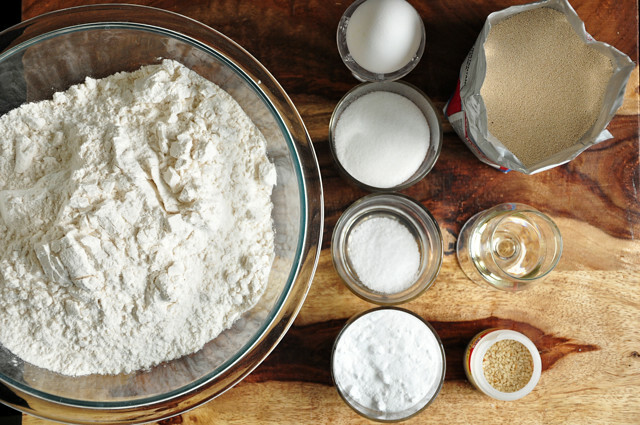 Continue cutting the dough into even pieces until you end up with 16 small dough nuggets. Or 32 for mini pretzels. I guess these aren’t really nuggets. They’re more the size of large rocks. 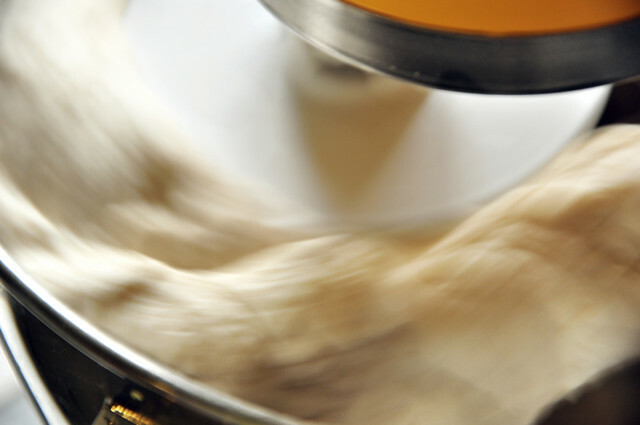 Let’s start rolling out some dough, shall we? Roll each, one at a time. 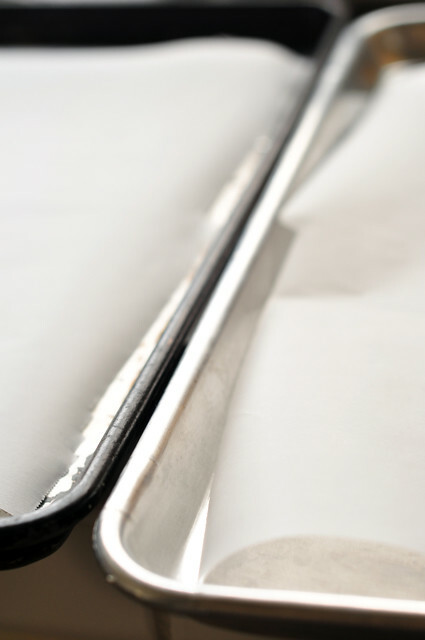 Into a long thin piece. 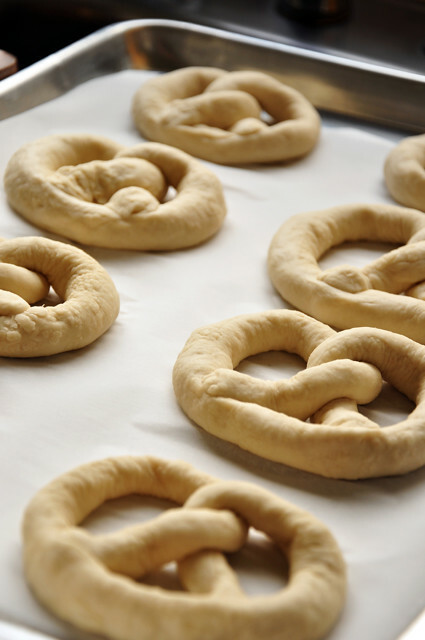 Now its time to shape the pretzels. 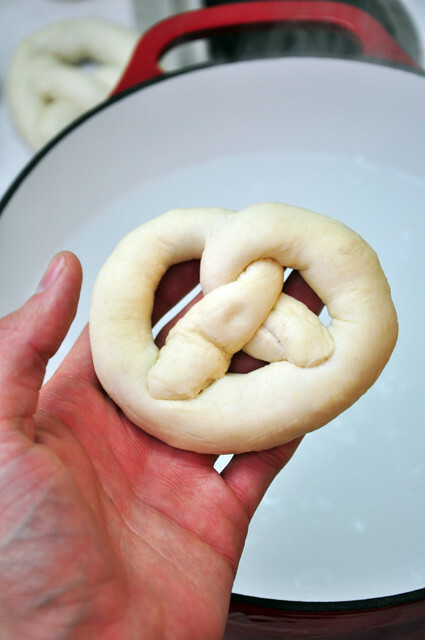 Don’t know how to shape pretzels? Well let me show you how, that’s what I’m here for. To help and teach you. 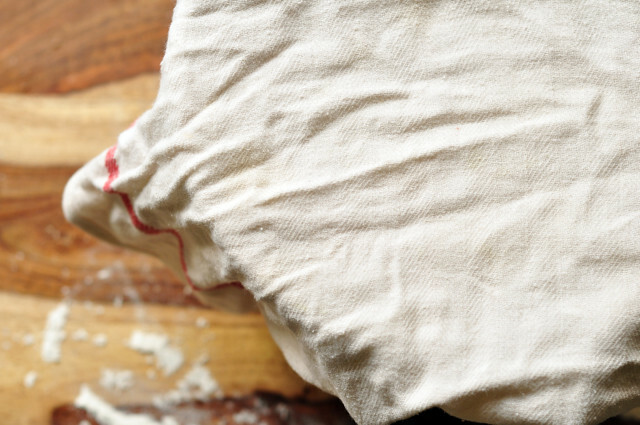 Grab two baking sheets, if making 32 you’ll need three sheets, and line them with parchment paper. This will make removing the pretzels a lot easier. 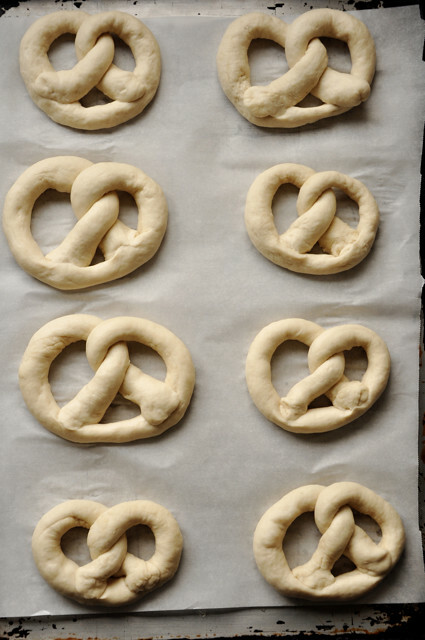 Place the shaped pretzels onto the baking sheets, 8 on each. Evenly line and space them. 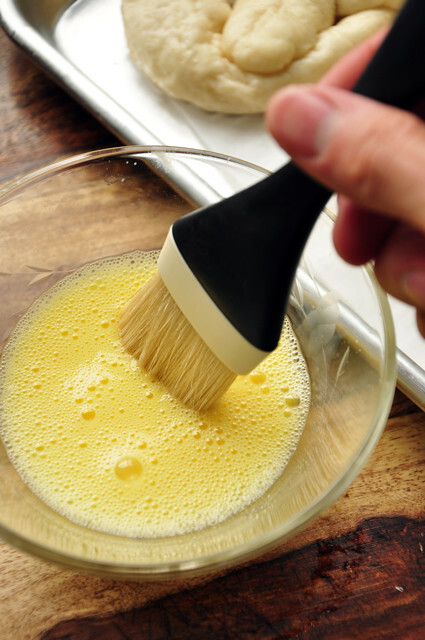 Loosely cover the pans with plastic wrap. 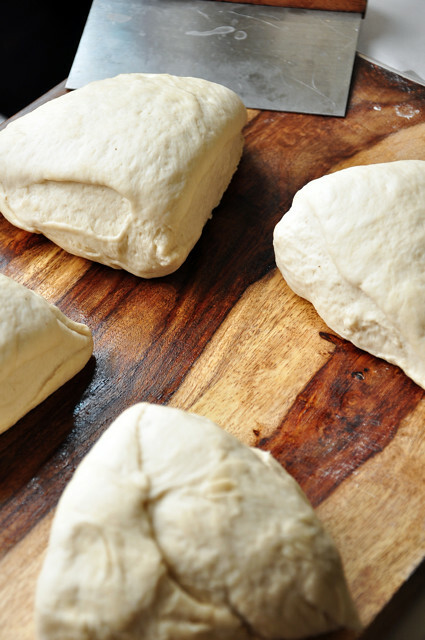 Pop them in a warm place and allow them to rest and rise for about 15 minutes. In the meantime, bring a large pot of water to a boil. 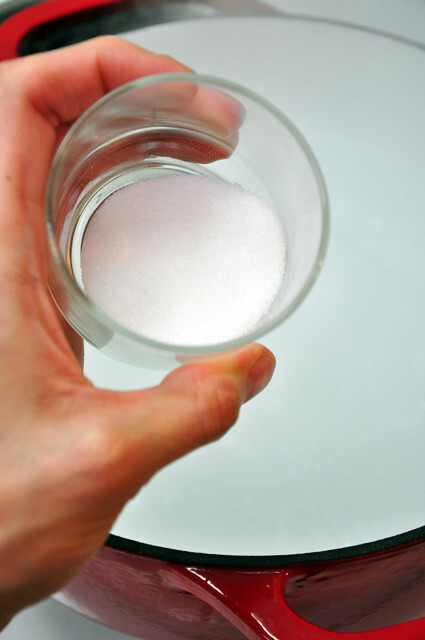 Drop in the baking soda. 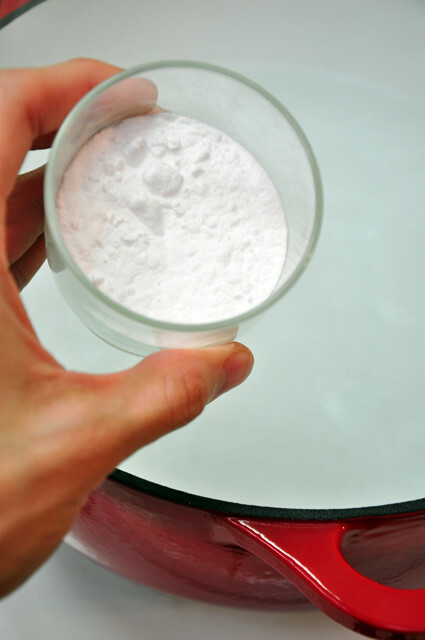 Be careful when you add the baking soda. 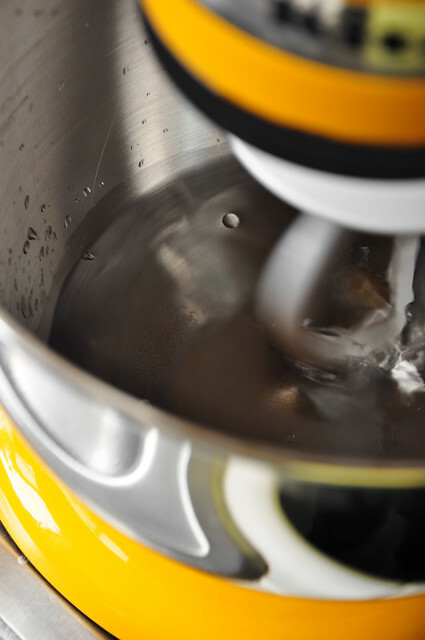 Stand back, as the water will bubble rapidly. 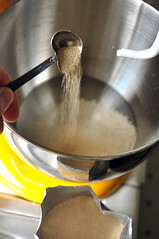 Next, add the remaining sugar. The pretzels should be done rising by now. 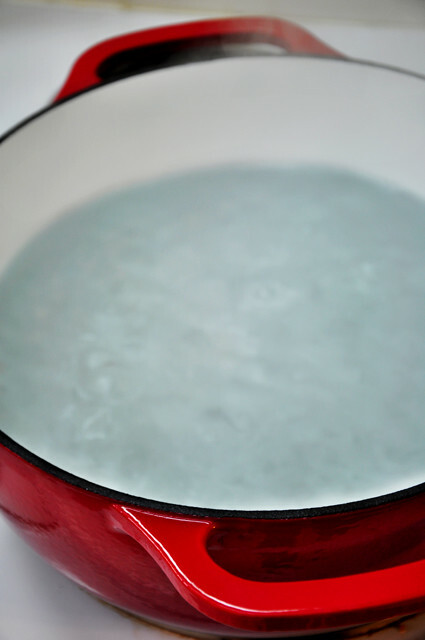 Lower the heat and allow the water to come back to just a simmer. Carefully drop in the pretzels. Do not overcrowd the pot. Depending on the size, I would do about four at a time. 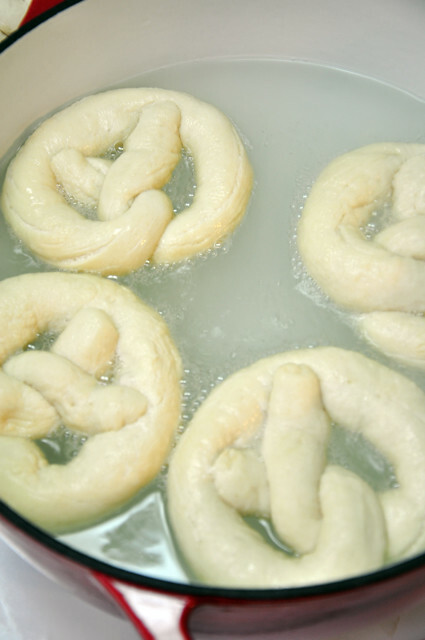 Allow the pretzels to cook for 1 minute. Flip them over and cook for another minute. 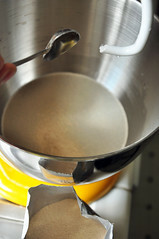 Once both sides have cooked, scoop out the pretzels and let the excess water drain off. 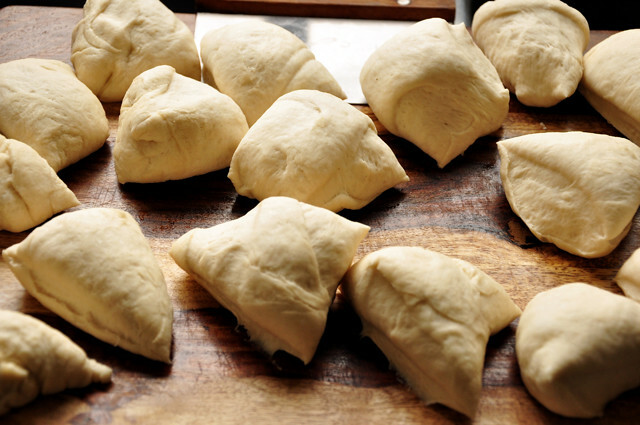 Place back onto the baking sheets, and continue cooking the rest in the same manner. 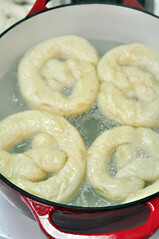 After all the pretzels have boiled, it is time to make an egg wash.
What will an egg wash do for these lovely pretzels? 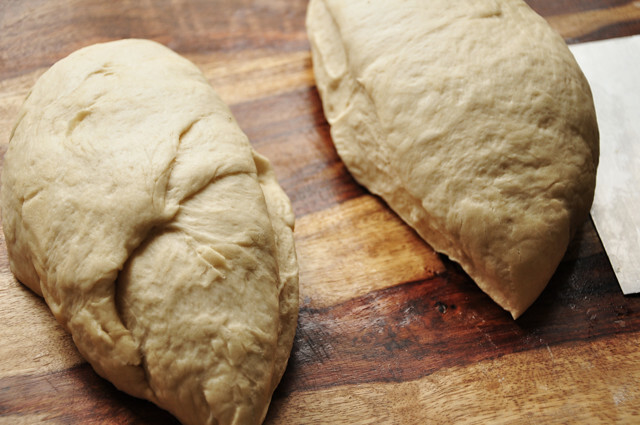 Well, it’ll give them a nice glossy, brown and crusty outer shell, as they bake in the oven. 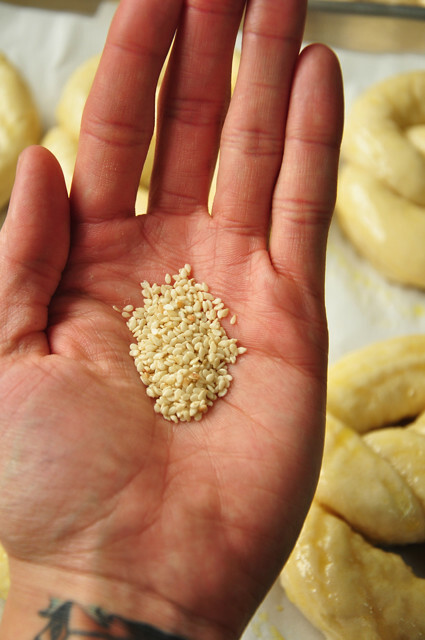 And it gives the sesame seeds something to stick to. 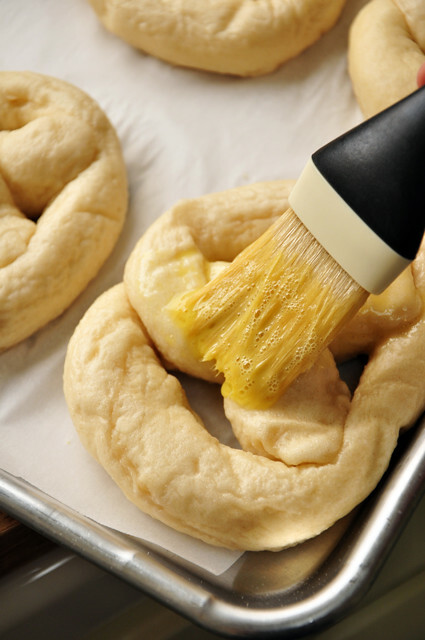 Brush the top of each pretzel, evenly and liberally. And now for the topping. 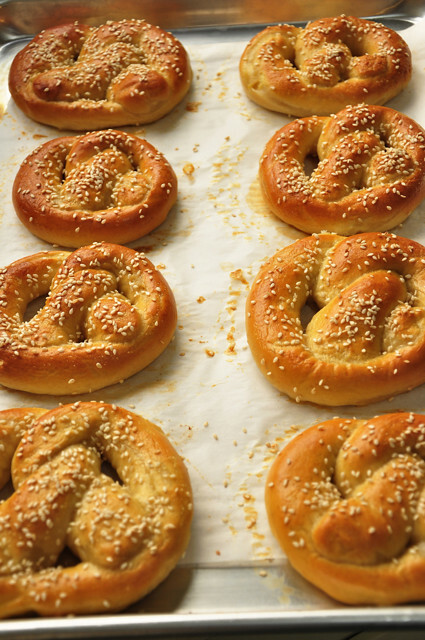 You can use pretzel salt, or a coarse salt if you’d like, as well. 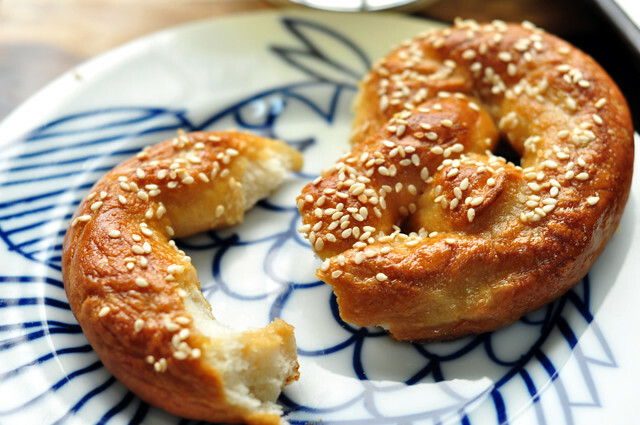 But I happen to really enjoy sesame seeds on my pretzels, so that’s what I used. 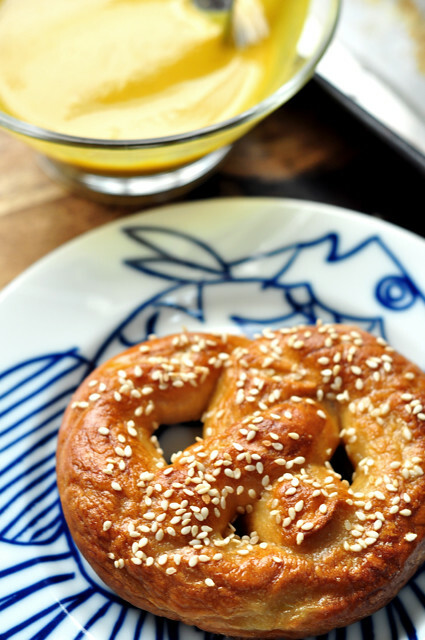 Sprinkle a pinch of the seeds over each pretzel, the egg wash will help them stick. 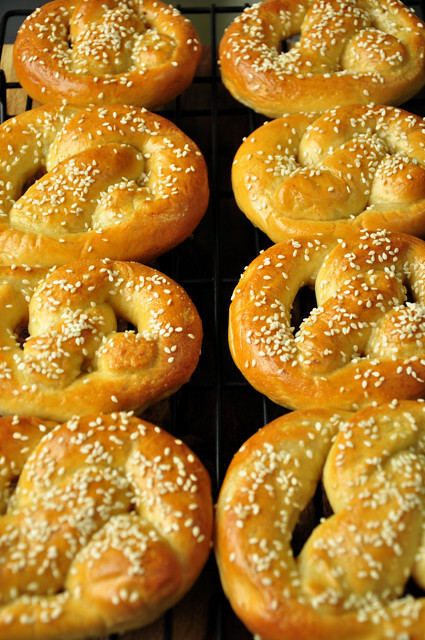 The pretzels are now finally done, and ready to hit the oven. 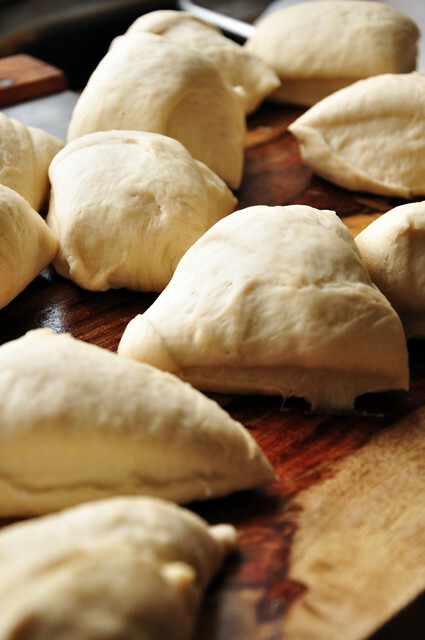 Bake them in a preheated 450 degree oven, for 12-15 minutes, rotating the pans half way through baking. 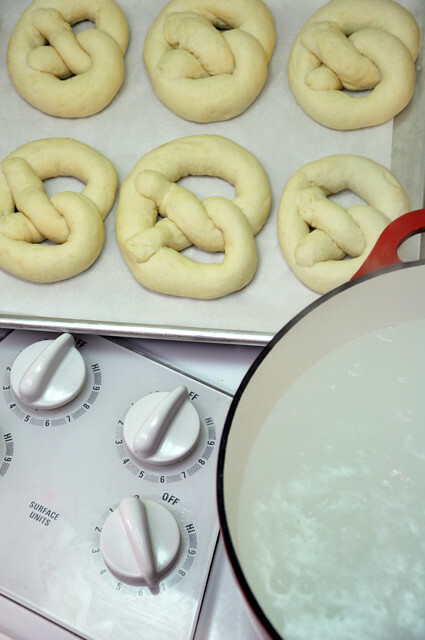 Allow the pretzels to cool, slightly, on the baking sheets themselves. 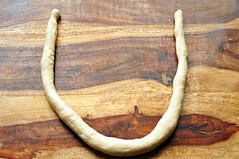 Transfer the pretzels onto a cooling rack and allow to finish cooling completely, or eat them at this point; slightly warm and still crusty. Okay, so we’re ready to eat them right? No!?!?! Why not? They look ready to me! 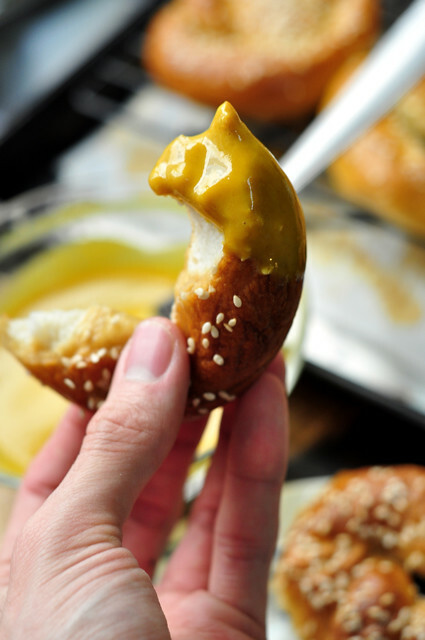 Well, no pretzel is complete without a little dipping sauce. 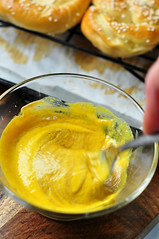 But I don’t just want some ordinary mustard to dip my pretzels into. No! 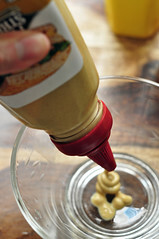 No, I want a honey dijon mustard sauce. Have no fear, its the simplest thing ever. 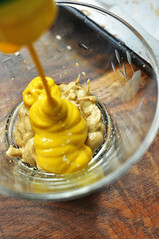 All you need is yellow mustard, dijon mustard and honey. Squirt. Squirt. Squirt. Mix. Super easy right? 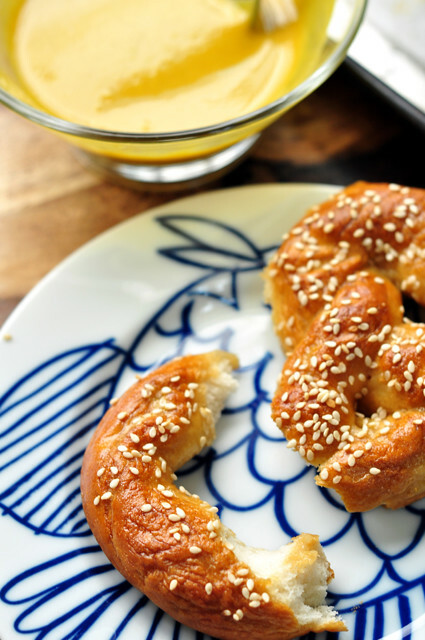 Okay, now we’re ready to eat pretzels right? Let’s take a moment and enjoy this view. Okay, that’s enough admiring. 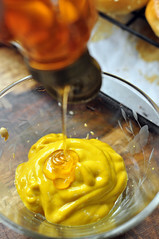 Go ahead and dip it into the honey mustard. 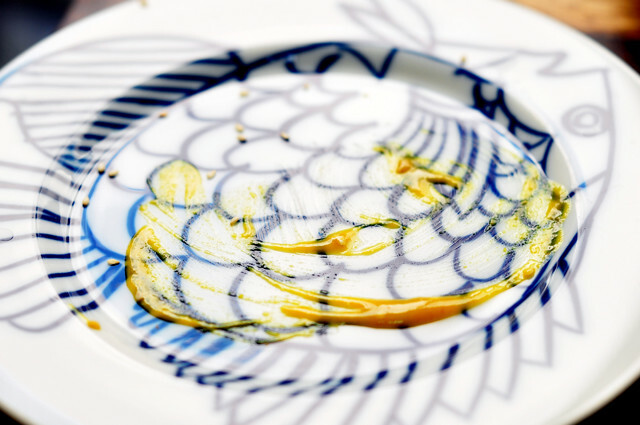 But they wouldn’t really need to ask; they could just look unto my plate. 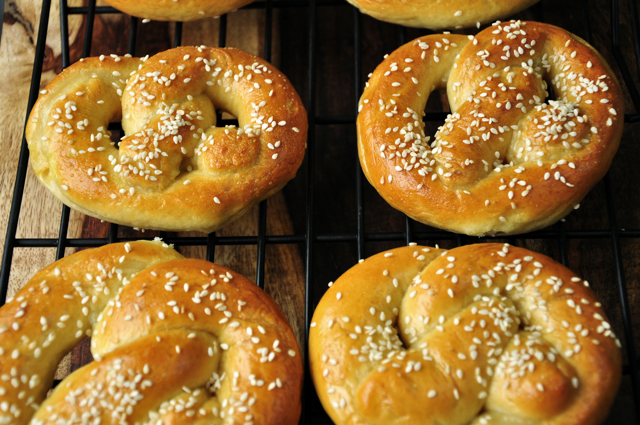 So go on and make you and your loved ones some soft baked pretzels. I do have to warn you though, they go away faster than it would take you to make them. With a blink of an eye, they’ll be gone. So eat as many as you can, as quick as you can. Don’t forget the mustard. 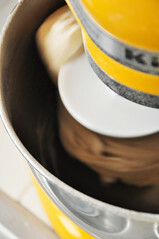 Taken and adapted from Martha Stewart. 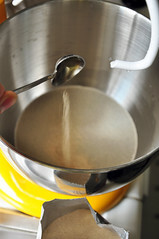 Pour warm water into bowl of an electric mixer. 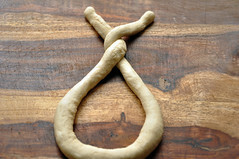 Attach the dough hook. 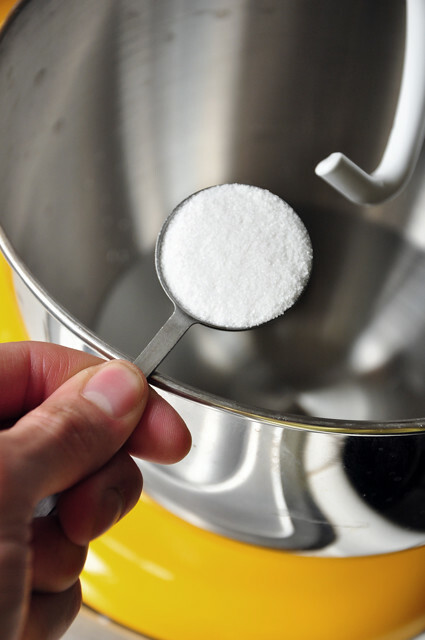 You can also just use a bowl and wooden spoon to mix it by hand. 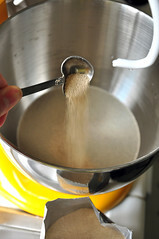 In a small bowl, combine water and sugar, and stir to dissolve sugar. 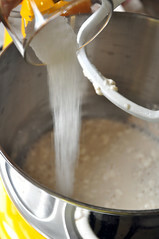 Sprinkle with yeast, and let sit 10 minutes; yeast should be foamy. 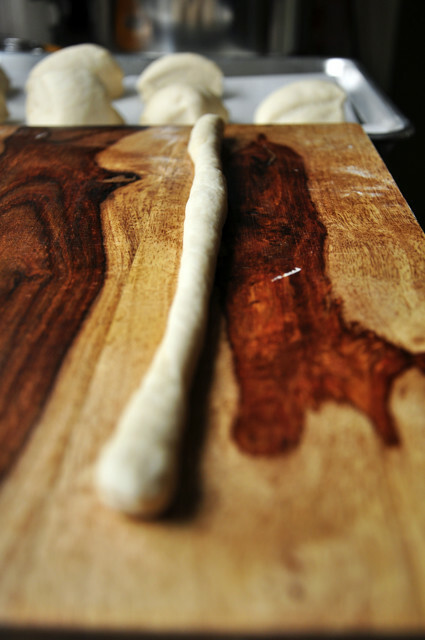 Roll one piece of dough at a time into an 18-inch-long strip. 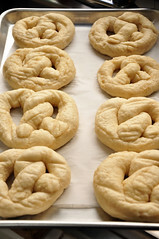 Twist into pretzels shape; transfer to prepared baking sheets. Cover with plastic wrap and a kitchen towel. 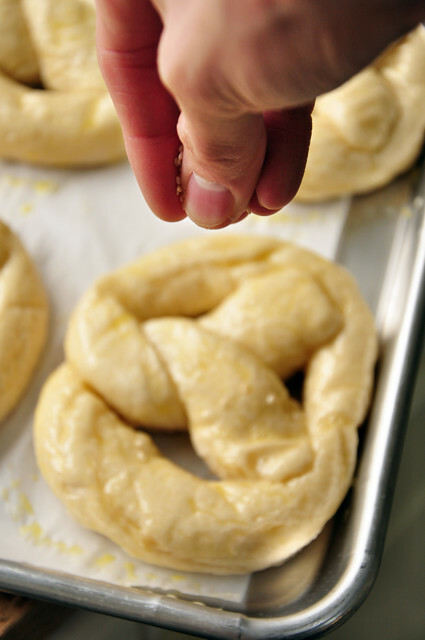 Let pretzels rest until they rise slightly, about 15 minutes. 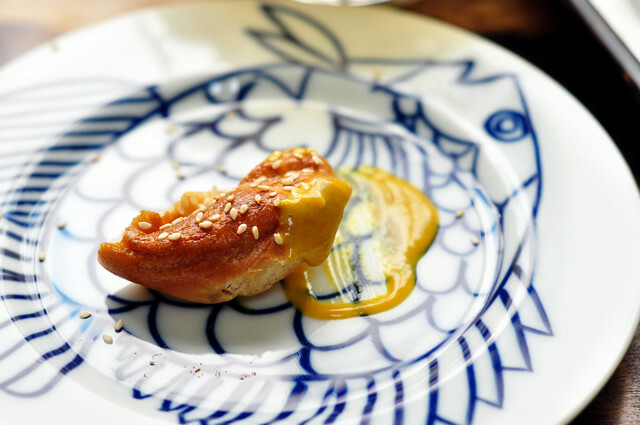 Beat egg with 1 tablespoon water and brush pretzels with egg glaze. 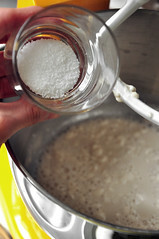 Sprinkle with the sesame seeds or salt, if using. Bake until golden brown, 12 to 15 minutes. Let cool on wire rack, or eat warm. 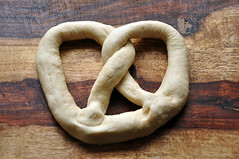 Pretzels are best when eaten the same day, but will keep at room temperature, uncovered, for 2 days. Do not store in covered container or they will become soggy. Enjoy. Recipes like this one, make me VERY happy I’ve found The Candid Appetite. 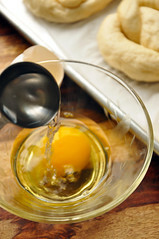 I promise to try this, since like you say… if you can make this in such a small kitchen, I imagine I can too ! By, the way… my scones turned out like in your pictures ! Tasted great too. I’ve been thinking next time to substitute feta and basil for the cheddar and dill ??? Thank you. I too am very happy that you found Candid Appetite. 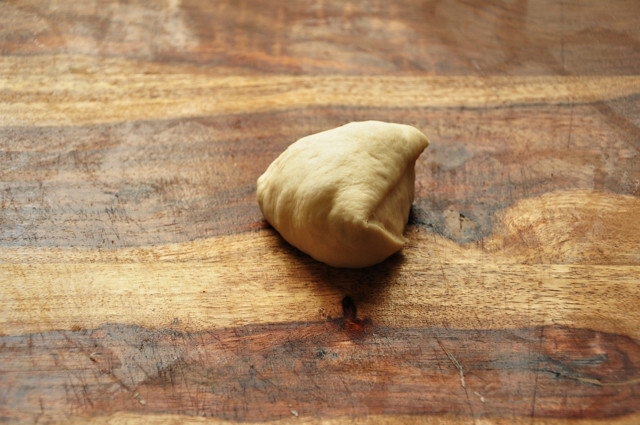 English muffins sounds good, filing that in the right place. They’re super easy so yes, please make them and let me know how they turn out. And yay! So glad you made the scones. That would be great, feta and basil are yummy and they would taste great in a scone! 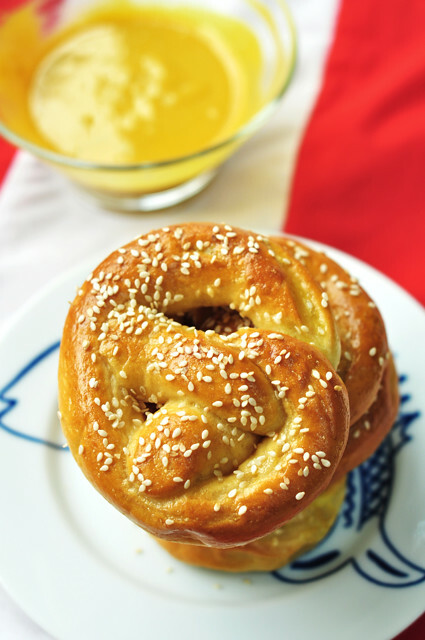 Soft pretzels are one of my favorite snacks and I have always been afraid to make them! But with your great step-by-step photos I may be able to conquer my fears! They look absolutely delicious! Thank you so much for checking it out! I hope you make them soon! Let me know how they turn out! Today was my first attempt at your delicious pretzels! Lets just say they were amazing. 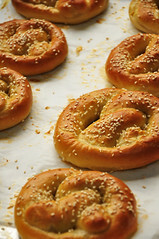 Instead of using sesame seeds for the topping, I used Kosher salt on some of them and cinnamon and sugar on the others. The salt was fantastic! They looked and tasted great! Now, the cinnamon and sugar ones tasted good but didn’t look very appetizing. They almost looked burnt. Apparently the cinnamon will do that = ). 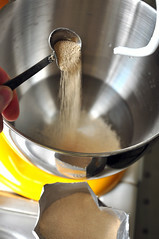 Anyway, do you have any tips on the cinnamon and sugar topping. I love the taste of it but would like them to look a little prettier. Thank you so much for sharing the recipe. Again, your step by step instructions were extremely helpful, I kept running back to your blog making sure I was doing it right. My family thanks you for the fantastic pretzels! 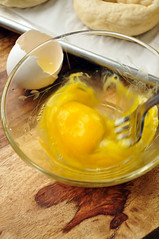 Thank you very much for reading and for trying the recipe! I’m so glad you liked it! The salt sounds fantastic, I’ll have to try that sometime as well. I’m happy that the step by step photos helped. Please come again any time! 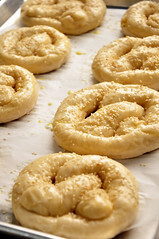 As for the cinnamon pretzels, I would suggest rolling in cinnamon sugar after they are baked. 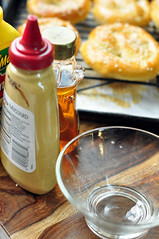 First, bake the pretzels plain, and then drop in or brush melted butter all over and roll in cinnamon sugar. It’ll be just like the movie theater or mall pretzels! Hope that tip helps. Let me know how they turn out. Thank you! lovely post 🙂 i want to make pretzels and freeze them so my bf doesn’t buy a new box every week. waste of money i TELL YA! Excellent tutorial! The pretzels look amazing! Making these now to surprise my kids when they come home from school. They’re in the oven & looking fabulous. Thanks so much for your awesome recipe & pictures. Your directions are excellent! Oh God these look amazing! 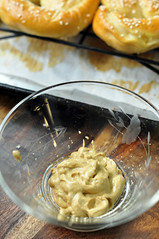 I just found your blog today… After I started another recipe (Alton Brown) for pretzels, the method is slightly different, I think mine being a little easier. This is my first time making pretzels, I’ll definitely try yours next! I’ve made a few diff. 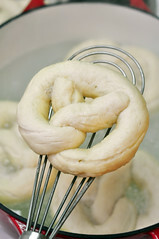 pretzel recipes but I must say yours is by far the most thorough. Great tutorials. I think how you go the extra step to have them rise once again b4 baking must be spot on b/c in my attempts with prior recipes, they always came out looking scraggly (which explains why I keep looking for better recipes!). 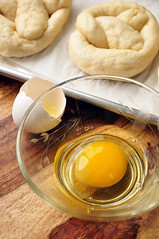 Going to try to make these today however, can you give us any recommendation on freezing the dough itself? 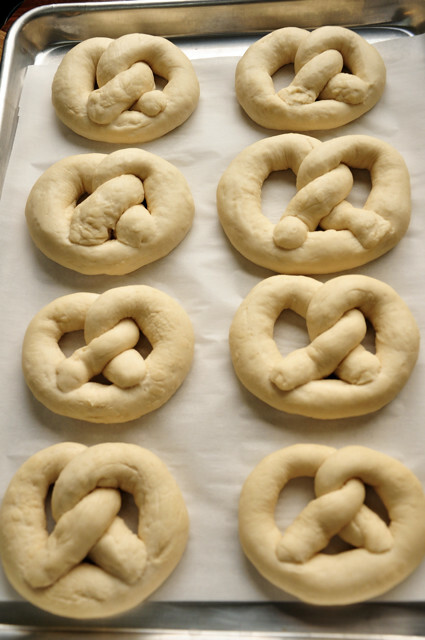 Being single I’d like to make a few pretzels for myself at a time and freeze the remainder in chunks for later use. Thoughts? Thank you so much for writing! I’m glad you enjoy the step by step tutorials! 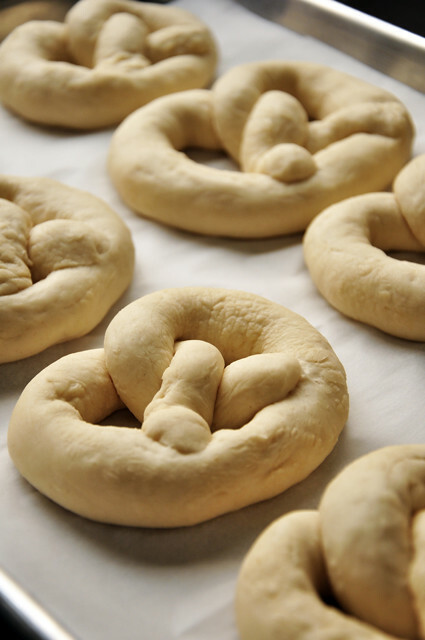 I’ve never frozen the dough before, what I have done is made the pretzels and then freezing them afterwards, each wrapped individually with plastic wrap and then put in an airtight container or bag. 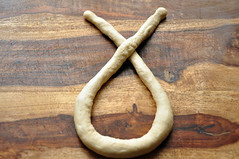 Then when I feel like having a pretzel I just take one out and warm it up in the oven. Hope this helps. Good luck! Let me know how they turn out for you! Loved your tutorial. Could I do them in a food processor? 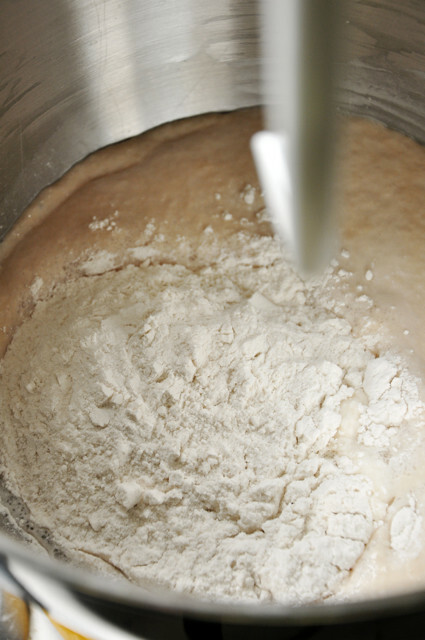 I make my pizza dough and pie crust in one. Thank you! 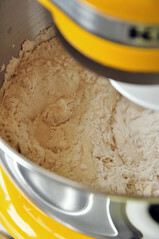 As long as you have a big enough food processor and use the dough attachment, then you are good to go!! Can the pretzels be frozen? 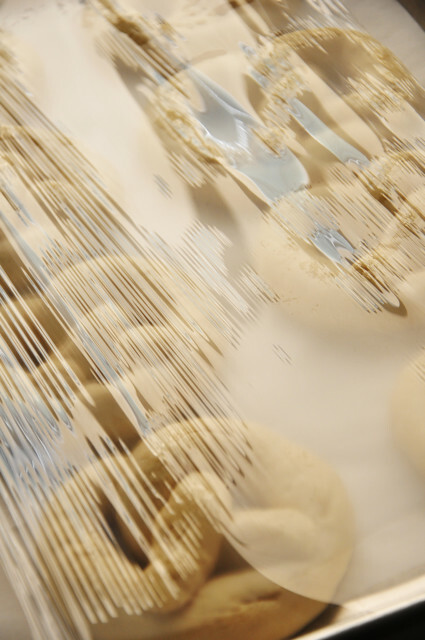 When is a good time to freeze…as they come out of the oven? Love the step by step. Most recipes don’t have you boil it. I need to try this to see if it is what is missing in my pretzels.